Detailing EM and Bingo pinball features, gameplay, and repair techniques. The 1940 Chicago Coin Fox Hunt is just about finished. Two shorted 'coils in a can' are taken apart and rewound. I have a trip relay coil to replace, as well as two springs that are not doing their job, and a shorted lamp socket. Otherwise, things are working pretty darn well. Serenade was picked up by Bingo Butch and his son, Mike, and Mike already has it up and running. Great finish to the year in bingos the pinball community just learned of its existence at the beginning of the year! Today's Year of Flipperless game is Genco's 1939 Airport. A beautiful machine with an interesting ruleset that requires the player to traverse the entire playfield across 5 balls, with a ball return feature. A friend of mine asked me to pick any meter I wanted to, to replace my really poor DMM that I've been fighting forever (thanks Ryan!). Good balance of price and features. Has a continuity test, despite being an analog meter, as well as a diode test. Both are basically resistance tests, but nice to have. Uses two double-A batteries, which is convenient. I talk a bit about my first service call using the meter, as well as some challenges specific to the game. Today's Year of Flipperless is Rockola's Screamo from October of 1935. Another proto-bingo, this time with a literal card layout, but a more fun playfield than most of the other early bingo concepts. I hope all my American listeners had a great Thanksgiving. I am very thankful for all of you. Today is a cautionary tale. Managed to set the game I was working on on fire... sleep is necessary, but so is remembering to remove a jumper before stopping for the night. Today's Year of Flipperless - Exhibit's 1934 Lightning '36. Some discussion of a pre-war game I'm working on currently, and the Year of Flipperless game, Chicago Coin's 1934 Show Boat. Scott Gullicks is part of Riot Pinball, LLC, who are best known for their creation "Wrath of Olympus", a full-size DMD-style pinball machine. This year at Expo, Scott unveiled a new project, focused on portability and competition: "Dead Man's Hand", which is based heavily on the layout of the card-themed bingos. Scott joins me to discuss his experience with bingos and the motivation behind the creation of "Dead Man's Hand". Bingo Butch Glauda is an operator and serious bingo collector. He owns one of each Bally bingo pinball machine and needs only three more United games to complete his collection. Butch tells many great stories about operating, which games made the most money, and his fascinating history with these great machines. He was extremely generous with his time, and I am pleased to have spent time with him after York this year. I recap the details from the York show! I had a lot of fun talking to everyone and watching them play the Multi-Bingo over three days! Thank you for coming out and giving the games a shot in the Bingo Row! The Multi had over 8000 Red/Yellow button presses over the weekend. That equates to roughly 400+ games. I'm thrilled with that number. Thank you to everyone that brought games and shared with the public. Today's 'Year of Flipperless' game is Baker's "Twinkle". Backglass animation, multiple ways to win, and a unique playfield mechanism make this game extremely fun and challenging to play. I was lucky to see it and play it at the York show! The Multi-Bingo will be available for you to play on September 29th and 30th, 2017! Come play it, say hello, and compete on any of the bingo pinball machines in the 3rd annual Bingo Row. Win a 4 or 5 in a row, come show me, and you'll receive this year's prize: beautifully illustrated key fobs by Ryan Claytor of Elephant Eater Comics. See if you can name all the bingo card styles represented! Today's game is the beautiful Bally Skyscraper - one of the first games with illumination. A skill score is added to your eventual total, to award a maximum of 45 replays! ... just remember the show title. I had some folks over to playtest the game - outsiders tend to play the game differently than I do, so it's valuable to see if anything new breaks. Out of many many games played and discussed, only one new bug appeared. I have figured out how to mitigate it. I've also been working really hard to put the polish on the game. It looks great, plays great, and I'm trying to make it as good as it can be before York. Speaking of York - come to the Bingo Row at the White Rose Gameroom Show Sept. 29th and 30th in York, PA! Play the game and try for a 4 or 5 in a line to win a prize, made just for the show! It's got a really interesting layout that looks very challenging. I love gobble holes, love curtains, and love a good sequence game with a good payoff for skillful play. Looks like the total package! 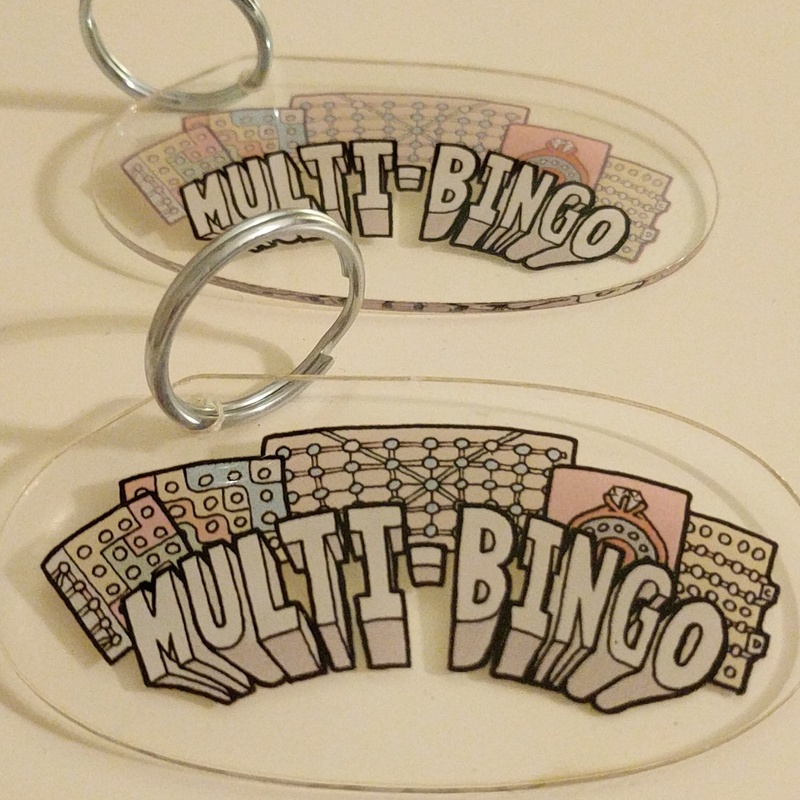 The Multi-Bingo is really taking shape. I discuss some of the difficulty in introducing bugs that are unexpected when thinking about the reset sequence of the EM games vs. a solid state. Today's year of flipperless game is 1934's Exhibit Golden Gate. Golden Gate has an interesting middle playfield feature that allows for high scoring if you land balls in the 'open gate' hole. You can also return 'Out' balls to play by hitting a different hole. Fun looking machine with an interesting gimmick.